Pollinators such as bees and butterflies are busy and wonderful helpers but they are in trouble. The biggest threat in the UK is habitat loss, so come and help our local pollinators by planting a wildflower meadow in East London! 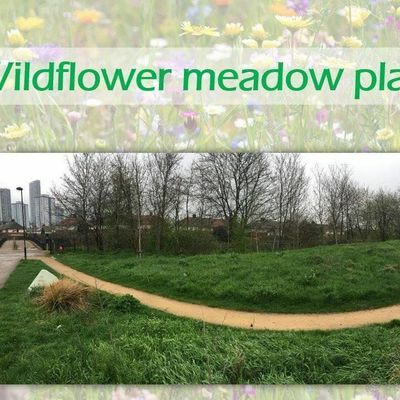 Register your interest here!THE CHALLENGELea Valley Park have teamed up with Hackney & Tower Hamlets Friends of the Earth to create a wildflower meadow in Three Mills Green, and we need your help for digging, seeding/planting and making this a success!Come and have fun whilst doing something for the environment! We also have a bee enthusiast on the day that will be explaining the types of pollinators we are hoping to attract, and the methods we are using to create our meadow. No experience is necessary, only enthusiasm required! Children are welcome as well!HOW TO GET THEREThe nearest station is Bromley-by-Bow in zone 2 (District and H&C line), and it's a less-than-10-minute walk to the green. (Google maps: Three Mills Green, London - https://goo.gl/maps/SxW5cNSvT6t)WHAT TO WEARMake sure you wear sensible clothes for working outside (jeans and an old sweater are recommended), and sensible footwear (boots and sturdy trainers are best, no sandals/open footwear please). If you have your own gardening/outdoor gloves please bring them, otherwise these will be provided when needed. We are hoping for sun, but if this changes to light rain we'll still be out planting so please bring a raincoat if this is the case!Please bring any food/drink/snacks with you for the day.Please RSVP here to let us know you're coming!